Popular photo editing and art creation software Pixelmator Pro received a major update today, adding a number of new and improved features. Pixelmator Pro 1.3 "Prism" introduces layer color tags, layer filtering and search, support for clipping masks, and quick opacity and blending controls located in the Layers side bar. With the color tags feature, Pixelmator Pro users can better organize their layers, while the filtering features make it possible to filter out layers based on layer type or color tag. Finding objects is easy in layer-heavy creations with the new search feature, and with clipping masks, you can clip the contents of one layer to the outline of another. Clipping masks are designed to let digital artists create better masks with the existing objects in a design. Clipping masks can be created from any layer, including text, images, layer groups, and nested shapes. The update also includes additional bug fixes and improvements, such as better support for exporting Photoshop documents and an improved nondestructive editing workflow. Affinity Photo, Affinity Designer and Pixelmator are cheap, incredibly feature rich and available now. Adobe has a lot of work to do if they think Photoshop on iPad is going to win everyone back. 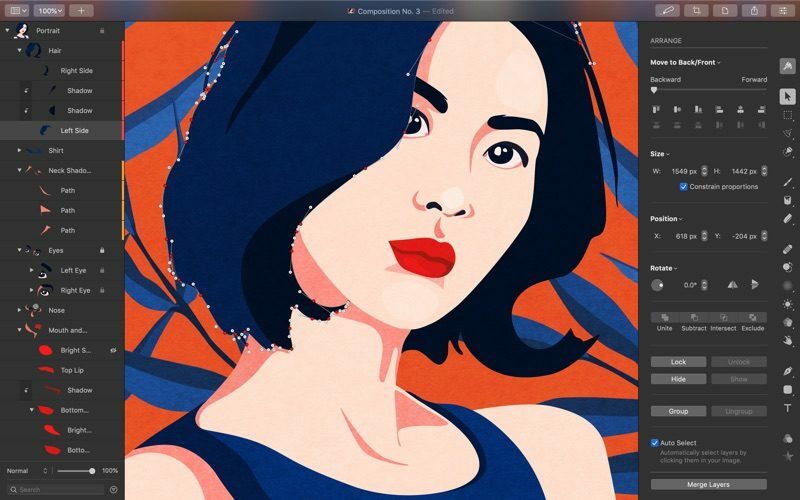 Before now, Pixelmator Pro had a way to achieve the exact same result for most workflows, but with this update, we've added clipping masks the way PS does them. Which (perhaps surprisingly) is pretty tricky to do and not many image editors other than PS have true clipping masks. Time for an obvious question — what kind of features would you like to see in an image editor like Pixelmator Pro? I love both pieces of software but i'll be honest after buying Pro I rarely use it - i'm a bit confused about if it's supposed to be a long term replacement for normal Pixelmator which seems to do more? Are there things Pro can do that the normal Pixelmator can't? Because it seems easier to use standard. I can't believe it didnt have clipping masks already. I've got base Pixelmator, and tbh it's less great than I thought it would be. Not exactly a Photoshop substitute IMO, yet. Yeah, I have to be honest in that I keep going back to Pixelmator, even though I have Pixelmator Pro. The UI confuses the heck out of me. I don't even know how to reliably 'export for web' anymore (which is one of the main things I do). I'll have to look into their forums or some tutorials one of these days. Un-intuitive, IMO. The big thing for me (why I upgraded... but now that it seems it's Pixelmator 2, even more the reason), is for the vector abilities (which I haven't had much time to use yet). but, I wish there was more UI continuity. Which parts of exporting for web are you having trouble with? Pixelmator Pro is objectively far more flexible (and full-featured) for this, but some things might be hidden away, so if we can make them easier to find, we probably should. As for continuity, that's difficult to argue against. We decided on a pretty radical redesign (to create a very Mac-native app), so in a way, we're starting with a brand new app from scratch. But in each update, along with big new things, we're adding little things here and there to make the transition from Pixelmator smoother. And all feedback on this topic is much appreciated. ETAs are a dangerous thing. Just ask the good folks at Apple... :D This probably won't come in the first half of the year, but might be an option for the second half. It really depends on how our overall plans pan out. I'm always impressed by how Pixelmator is slowly building itself up feature-by-feature to compete with thousand dollar software for only $40. "Pixelmator Pro is not a ‘professional’ version and Pixelmator is not an ‘entry-level’ version." Is the biggest mistake you made in the naming, should have just called it Pixelmator 2 to be honest because naming it pro makes it sounds exactly like that and there seems to be no reason to use the pro moniker than to indicate anything else. Also I agree with SteveW928, I don't find it any where near as intuitive and I often give up trying to use it as I can't work out how to do some simple stuff i'd nail in seconds in Pixelmator 1.